One part orchid, one part bromeliad our exotic garden is qual measure of fun an refreshing. The orchid, a variety aptly named “kaleidoscope,” mesmerizes with its striped petals that almost appear to move as they’re viewed from different angles. The bromeliad, a tropical favorite with fiery orange petals, adds a welcoming warmth to the mix nestled amongst the plants’ glossy greenery. 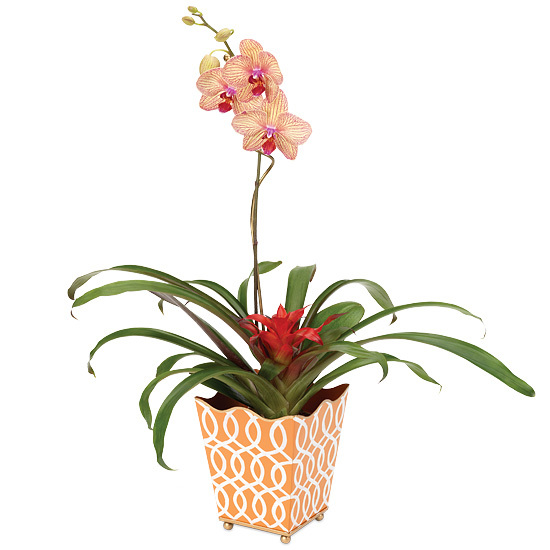 Planted in a 5″ grower’s pot tucked inside our delicious sorbet cachepot hand painted with a white and tangerine geometric design and golden brim and footed base. 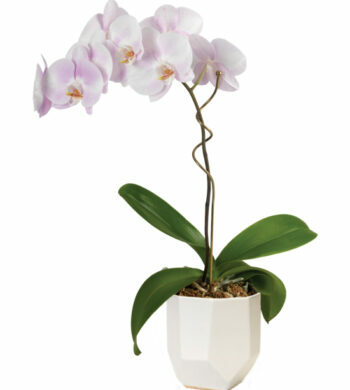 Add our plant pin to give the orchid a stylish support. Place the garden where it will receive low, indirect light. It will do best with temperatures between 59 to 79 degrees. Take garden out of container to water and drain. 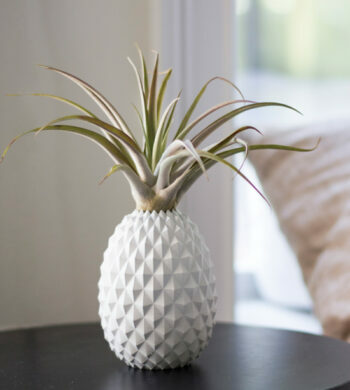 To water, put a half-cup of water in the center of the bromeliad known as the “cup.” Next, water the soil with another half-cup of water. Good drainage is essential and will help to prevent root rot. These plants like humidity between 40-50%. Misting will help increase humidity. Fertilize once a month with a balanced orchid food at half strength. Do not fertilize while flowering.